pynkrabbit (Grade: A+) Excellent story about a Martian astronaut that gets stranded accidentally when his mission is aborted. Mr. Weir creates a gripping, fast paced narrative with very relatable characters and a good amount of humor thrown into the mix. One of the best science fiction books I have read in the last year. Highly recommended. Muisje (Grade: A–) Made me bite my nails too many times. Was sad when it ended, also felt like there could have been added more. Addictive, fast-paced, exciting, sometimes uncomfortably realistic but at times also funny scifi with major emphasis on the 'science'. Obie (Grade: A+) A phenomenal survival story absolutely full of humor. Mark Watney is a sarcastic engineering fighting for survival on Mars. His gallows sense of humor defines a large part of the story and makes the horror of his situation more bearable. 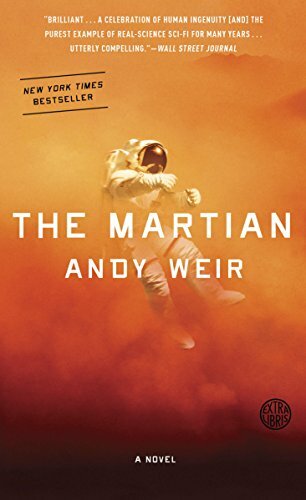 Weir details the science used by Watney to survive in such a desolate and barren wasteland. The science is as much of a character as Watney. senzanom (Grade: A–) An excellent Robinson Crusoe-like story focusing on the survival of a lone astronaut on Mars, accidentally left for dead during an emergency evacuation back to Earth. This is only science fiction in that it's happening in the future that could be next year. Almost all of the science in this book is possible or actually exists. bennettgavrish (Grade: C–) A blunt reminder that I'm not - and never will be - a true sci-fi nerd. There's amazing details and research in this book, but as a work of fiction, it is severely lacking. The progression of events on Mars becomes monotonous and downright dull at times. Entire chapters are devoted to the digging of holes and the building of rock piles. Weir is smart to shift perspectives halfway through the novel, but the dialogue that takes place on Earth is just as painful and formulaic.